The University of Texas is Austin’s lifeblood. Austin was once a sleepy college town, but students who fell in love with the city began sticking around after graduating, and eventually it became a hustling, bustling metropolis. The high-tech industry boom brought even more crowds to Austin and it is now the fourth largest city in Texas. Because the campus area is so expansive, if it’s your first time to tour the area, a car ride is the best way to get a feel for the area. Certain parts of the UT campus are not accessible by car, so if you want to see it all, you may want to make some stops and walk around. Let’s begin your car tour of the University of Texas campus area at Martin Luther King Junior Boulevard near I-35 or Red River. 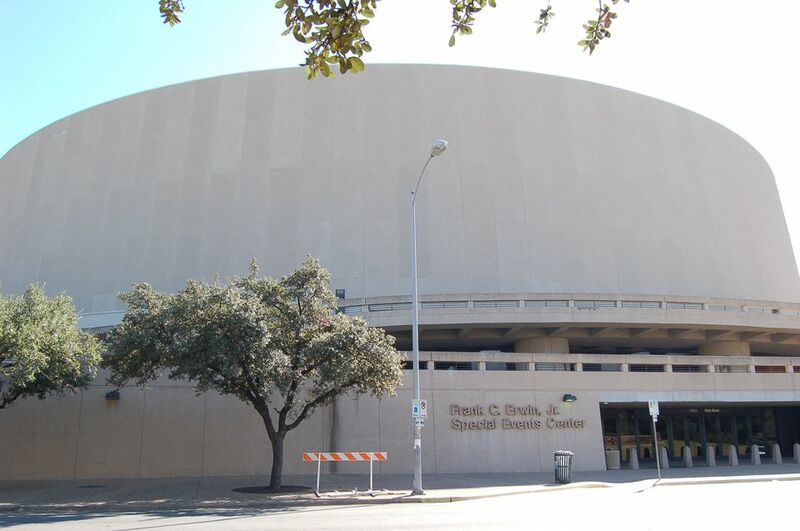 As you head west toward campus, you will see the behemoth Frank Erwin Center on your left, which belongs to the University of Texas and hosts everything from speeches by the Dalai Lama to Longhorn basketball games to concerts by the Nine Inch Nails. On your right, you will pass by the University’s Blanton Museum of Fine Arts, a building that exhibits thousands of masterpieces from the past and present. On the opposite side of the street, you’ll catch a glimpse of the Texas Capitol building. Soon after, you’ll see the massive Bob Bullock Texas State History Museum, which tells the story of Texas through exhibits and films, and houses an IMAX theater. Next, turn right on Guadalupe Street, or what Austinites call, “The Drag.” Then take a right onto 21st Street. On your immediate right is the towering Dobie Dormitory, a private dorm that sits atop of the Dobie Mall. If you're thinking about going to school here, stop by and ask for a tour. The mall below Dobie is not a traditional mall; it has a food court, but feels more like a strip center; it has a nail salon, comic book store, small café, and test prep center. While the mall itself isn’t anything to write home about, the Dobie complex also contains Dobie Theater, which has a quirky Austin feel and features primarily independent films. Shortly after you pass Dobie, on your left you will see UT’s Harry Ransom Center, a humanities research and conservation powerhouse that is home to a collection of millions of original manuscripts, photographs, films, books and many other fascinating bits of history. Many impressive artifacts are on display for public viewing; one piece of the permanent exhibit is the first photograph ever taken. Frequently on display are original manuscripts from classic novels. Stop in for a free visit. Just after the Ransom Center is the beloved Littlefield Fountain, with striking European-style statues of leaping horses. Behind the statue you will see “the Six Pack,” which is a part of campus that houses academic buildings in the shape of a six-pack of beer. It also has a beautiful grassy mall in the middle where students nap, study and chat. Just beyond the Six Pack it is the UT tower, notorious for the deadly 1966 shootings, but a beloved symbol of the university (and it is lit up burnt orange on special occasions). If you want to further explore this beautiful area, park in Dobie’s garage on the corner of 21st Street and Whitis and take a stroll. When you’re ready to get back into the car, you have two options. You may be able to immediately turn around and go back to Guadalupe. If it is the morning or afternoon on a weekday, you cannot enter without a permit, as there is as guard booth. However, if it is a weekend or early evening, you can pass through. If you continue into campus, you’ll see a business school building on your left and the enormous Perry Castañeda Library on your right. After the stop sign, you’ll see UT’s Gregory Gym on your left, where students exercise. The huge buildings on the right belong to Jester, UT’s largest dormitory (and one of its oldest). You’ll dead-end at the Darrel K. Royal Memorial Stadium, where the Longhorns play football. If you made it this far, feel free to park and walk around and get a feel for campus life. Once you're done, turn around and head back to Guadalupe, as navigating the campus roads after this point gets pretty tricky. Once you’re back at Guadalupe, make a right and continue down the Drag. You’ll spot students walking to and from class and you’ll see the University Co-op on your left, which sells every type of UT memorabilia imaginable. You’ll see a variety of unique shops and restaurants on the left side of the street. If you feel like exploring, park the car (if you can't find a meter, there's a pay lot just north of Dean Keaton, and a pay parking garage behind it) and walk down the Drag. The sprawling communications building at the corner of Guadalupe and Dean Keeton is the site of the KUT and KUTX radio stations, the journalism school and a wealth of TV studios and other facilities. Luminaries such as Walter Cronkite, Bill Moyers and even actor Matthew McConaughey spent time here during their college days. If you have time to stop, the building also has an exhibit featuring 25 UT alumni who have won the Pulitzer Prize. At one time, the Austin City Limits TV show was filmed here, but it now has a studio of its own in downtown Austin. When you hit 24th Street, make a right. This takes you right into the heart of campus. On your right is the student union building, which has an underground bowling alley, a movie theater, quick eats, lounges, an unofficial nap room and a variety of rooms for special events and meetings. Make a left when you hit your first stop sign. On your left is the Littlefield Home, a beautiful Victorian house. It was built in 1893 and was the residence of George Littlefield, a banker, Confederate officer, cattle baron and campus benefactor. It now holds UT offices, though special events are occasionally held there. As you continue down the road, you’ll see the enormous University of Texas communications buildings on your left. These buildings house the KUT and KXAN radio stations, UT’s Daily Texan newspaper, filmmaking studios and much more. When you arrive at the stoplight at Dean Keaton, you’ll see Kinsolving Dormitory ahead and to your right. This is a women’s-only university dorm during the school year, though it sometimes houses males in the summer. Go left at the stoplight, and then left again at Guadalupe. While you’re here, you may want to stop for a bite to eat at Madam Mam’s; the pad thai is a campus favorite! When you get to 24th Street, take a right. The large, white building on your left is the Castilian Dormitory, a university-owned dorm. At Rio Grande, you will see Cain & Abel’s bar and restaurant on your left. This is an extremely popular spot with the college crowd, especially on Tuesday nights. The outdoor bar is a much-enjoyed spot to sip a beer or margarita and people watch. Shortly after you pass Rio Grande, you’ll see a set of large brown buildings on your left. This is University Towers, a private dorm that is known to be a little wild. Make a right on Pearl Street to continue into the heart of West Campus. On your left, you will see some of the major fraternity houses, such as Sigma Alpha Epsilon. Turn right on 26th Street. As you continue, you’ll see a variety of apartments and homes occupied by students. West Campus is the center of Greek life and underclassmen activities. You will end up back at Guadalupe, and that’s the end of your tour of the campus area! Make a stop in the UT Co-op for some burnt orange garb or grab some pizza at the Mellow Mushroom on the Drag. If you’d like to explore the innards of the campus, you may want to stop by the main UT building, which is housed in the same building as the tower, and ask for a campus tour.